ConCertPrep provides emergency medicine physicians with a succinct, didactic review of key emergency medicine concepts for the ConCert exam. This elegantly designed peer-reviewed course is intended strengthen your EM knowledge and prepare you for the exam. Successful: Our review is guaranteed to help physicians improve their performance on the qualifying exam. We customer tailor our review AFTER receiving feedback from customers who passed the exam. In fact, when the review text and online course are purchased, we guarantee you will pass the exam or your money back! Convenient: We offer two great options to make it easy for you. Our online course is audio and pictures you can review from the convenience of home. 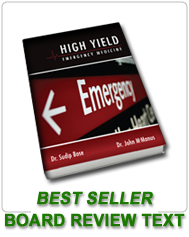 Our comprehensive text, High Yield Emergency Medicine, is a perfect outline for study emphasizing the most relevant material. Efficient: Our well-focused review with emphasis on exam trends is perfect for the busy physican. Affordable: Starting at $250, no other review is cheaper!